In 1986, in his last book before an early death, Gary urged us to Say No to the New World Order. He was a great man, and the prophet of our age. Gary, we miss you. Friends of big government, like HUD secretary Jack Kemp, can get away with things that would destroy an anti-establishment figure. Jim Watt described an affirmative-action committee as having “a Jew, two blacks, and a cripple.” and he wa–zoom–gone. But Kemp, pulling his car into a handicapped parking space in front of a Southern California newspaper, can say to an editor, “I’m handicapped–I work for the government” without being arrested by the Sensitivity Police. The government tells us that AIDS cannot be transmitted “casually.” The government also tells us that it should raise our taxes, and risk our sons for Saudi Arabia. Among his recommendations: !) Wear rubber gloves when handling the clothes, dishes, etc. of the patient. Wear a surgical mask if he is coughing or wheezing. 2) Use paper palates and cups and burn them afterwards. 3) Boil all his laundry for at least 15 minutes. 4) Pour a half cup of Clorox in his bath water before draining it. 5) ALways wipe the toilet seat with a soapy paper towel. Do not put the towel in the toilet, but in a paper bag to be burned. 6) No kissing, since AIDS can be transmitted by saliva. 7) No sexual relations, since condoms are far from foolproof. 8) Do not allow the patient to eat in a restaurant. 9) Do not allow the patient to drive or operate machienry due to mental impairment. A scan of this newsletter can be found at @RP_Newsletter, “October 1990: The Ron Paul Political Report”. 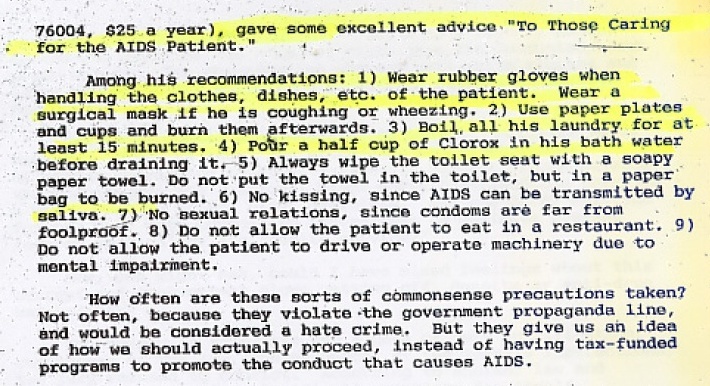 On August 19th, 2014, the full text for “Caring for the AIDS Patient” was added. On August 19th, 2014 the link to this report was changed from a defunct one at the New Republic to scans at the blog @RP_Newsletter.